Serving the 1st Roman Emperor, Augustus, you will need to mobilize your legions to control provinces of the Empire and its senators to ultimately obtain the title of Consul. The aim of the game is to earn as many points as possible before any players has taken control of seven objectives. Throughout the game play, players must strategize so as to manage the risk of claiming the rewards that are available to them in order to maximize the points gained. Players also have the opportunity to wreak havoc with their opponents by causing them to lose some of their legions or objectives, thus foiling their plans on becoming the next Consul! In order to guarantee full disclosure I admit now that I love Romans. I could probably enjoy Roman monopoly, probably. So I have much joy in informing you that this is both Roman themed and fantastic. Everytime I play Augustus I love it, I play it with friends, family , pretty much anyone. Its one of those ‘oh so simple’ games that lets anyone play and provides strategy for those wanting it. The game has you trying to conquer either Roman people or places (objectives). Each person or place has its own combination of symbols onto which you can thrust one of your little red wooden legionnaires. Careful though you have a fixed number and three possible conquering opportunities at any one time. You take it in turns to pass the bag of discs around the table reaching into its velvety depths and pulling forth a token on which is a symbol – some more rare than others. Its like bingo with Roman chariots, daggers and swords. Then everyone places a wooden legionnaire on that symbol should they have it on one of their three objectives before them. Once you have a legionnaire on each symbol of an objective you can below ‘Ave Caesar’ at the top of your voice (never gets old) and then you gain whatever special effect may be on that objective as well as some victory points for the end of the game. The fact that there are various special effects and lots of combo objectives give this game a hidden layer of strategy. Add to this a number of bonuses available to all players depending on who is first to complete different sets of objectives and this will also keep you keeping one cautious eye on the other players and cursing every time bellows ‘Ave Caesar’ in your ear. All in all I can’t really recommend this game enough, its not going to have you playing for hours but is a brilliant opener to any games evening and one that just about anyone will understand and enjoy. I was able to break this game out for Christmas with my family. It played wonderfully with my family who aren’t big gamers, but they enjoy to play games from time to time. It didn’t take too long to teach and it was always a great time. We played with 2,4 and 5 players. Never played with 6. This game played differently each time and has a surprisingly deep level of replay-ability. I do think the game is due to have an expansion due to the nature of some of the cards. Its a very fun light weight game that can be enjoyed game heavy gamers and your family. It’s a must have for any family. 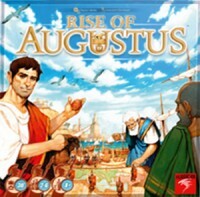 Add a Review for "Rise of Augustus"